Here is a list of 3 free Windows 8 break reminder apps. If you spend hours working on your Windows 8 PC, it’s good to have a break reminder app to save your eyes from any harm. These apps remind of of taking short breaks at regular intervals, so that your eyes may be prevented from computer related strain. Some of these apps show useful eye exercises that you can do in the break time, to relax your eyes and reduce the chances of eye fatigues. Moreover, they also allow to customize the break time according to your convenience, so that you can easily balance your working hours along with the timely break sessions. Let’s now start with the apps and get a brief overview of them one by one. Eyes Care is a simple and handy Windows 8 break reminder app that helps in reminding you of taking breaks during work. The app works by automatically displaying a reminder for taking a break of 5 minutes (at least) every hour, though you can adjust these times according to your need. The app displays three different type of reminders, including a simple text notification, a notification with an image but no sound, and a notification with a looping sound. It also allows you to customize the notification message and display whatever you want. During the break session, the app also suggests some eye activities that helps in keeping your eyes relaxed and strain free. You can read more about the app in our full review (link given below). 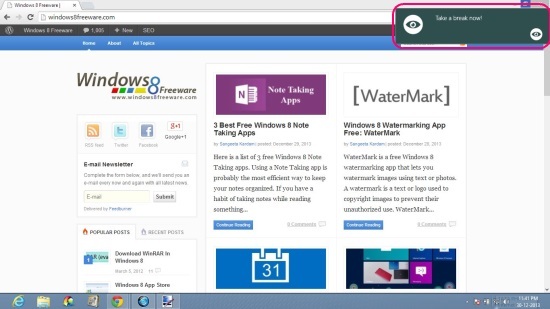 Eyes Care can be availed freely from the Tools category of Windows Store, or using the link as under. Click here to get Eyes Care. Eyes Saver is another free, easy to use break reminder app that allows you to have short break reminders at customized time interval. You can set the break duration and time (in minutes) after which you want to have a reminder, and Eyes Saver starts a timer after which it displays the reminder on your working screen once the timer reaches zero. While displaying the reminder, the app also plays a sound notification to catch your attention. You can anytime, go back to the app’s screen and stop the timer if you want. Once the reminder hits your screen, you can click on it to go to the app’s screen where it again plays a timer for the break session. After this session is over, you will be taken back to your work screen where you can easily continue with your stuff. This free Windows 8 break reminder app is extremely simple to use and operate and there’s no rocket science involved in its working; just set the break timer and you are all set with Eyes Saver. Avail it free from the Health & Fitness category of Windows Store, or using the link given below. 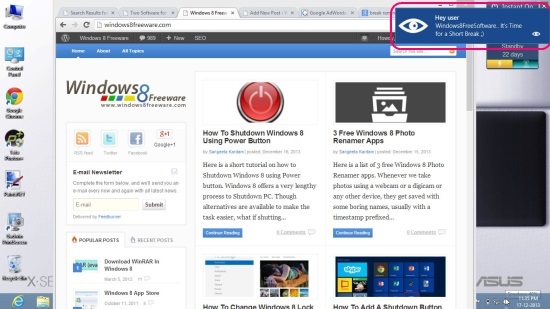 Click here to get Eyes Saver. Pomodoro Tool is another free Windows 8 break reminder app that works on the concept of pomodoro technique. Pomodoro is a time management technique in which a 25 minutes working session is followed by a 5 minutes break session to maximize productivity at work. Pomodoro Tool also works in a similar way, though the time durations can be customized. A very important point regarding this app is that it stops the count if you play it in background; so always use it in Snap mode if you are working with other apps or programs on your system. Avail Pomodoro Tool free of cost from the Productivity category of Windows Store, or using the link given below. Click here to get Pomodoro Tool. These were some of the best free Windows 8 Break Reminder apps we have found. All of them are equally good and provide effective ways to save your eyes from computer related strain. If you have a long working schedule, these apps will play an important role in reminding you of the timely break intervals. Do install them now and see which one suits you most. Do share your experience and suggestions via comments. 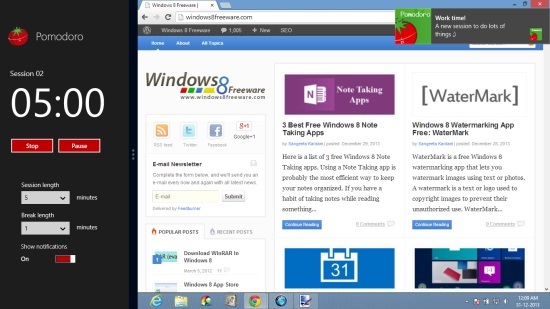 Also check out some best free Windows 8 Note Taking apps reviewed by us.